Description: This tree is 20-50' tall; it usually has a single trunk about ½-1' across and an elongated open crown, although multi-stemmed shrubby forms are known to exist. The trunk bark of young trees is light gray, smooth to slightly rough-textured, and speckled with flattened white lenticels (air pores). 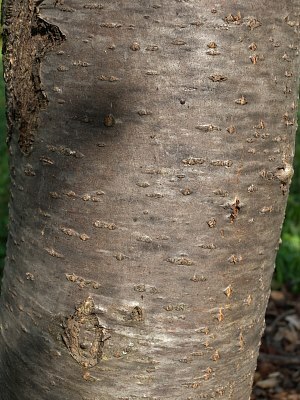 The trunk bark of older trees is dark gray, rough-textured, fissured, and slightly scaly. Branches are light gray and smooth, while young shoots are light green to reddish green and usually pubescent. The terminal and lateral buds of young shoots are conspicuously hairy. Alternate compound leaves are 6-10" long, odd-pinnate with 11-19 leaflets, and deciduous. The central stalk (rachis) of the compound leaf is light green or yellowish green, angular, and glabrous to slightly pubescent. Individual leaflets are 1-2" long and ½-¾" across; they are more or less oblong in shape, coarsely serrated (except along their basal margins), and blunt-tipped. Each leaflet has a short petiolule (basal stalklet) that is 1/8" (3 mm.) in length or less. The upper surface of each leaflet is medium green and glabrous, while the lower surface is light green and glabrous to pubescent. The stout petiole of each compound leaf is light green and glabrous to slightly pubescent. Flat-headed panicles of white flowers are produced occasionally from the axils of the leaves; these panicles are 3-6" across and erect to slightly nodding. The peduncle and pedicels of each panicle are light green and pubescent; later they become light brown or yellowish brown when the fruit matures. Individual flowers are 1/3" (8 mm.) across, consisting of 5 spreading white petals, a short green calyx with 5 teeth, an inferior ovary with 3-4 styles, and 15-20 white stamens. The blooming period occurs from late spring to mid-summer. The flowers are usually mildly fragrant. Fertile flowers are replaced by small fleshy fruits called 'pomes.' At maturity, individual pomes are about 1/3" (8 mm.) across, globoid or slightly subgloboid, bright orange to red, and usually 2-seeded. These pomes have a bitter flavor. The root system is woody and branching. This tree reproduces by reseeding itself. Cultivation: The preference is full to partial sun, moist to dry-mesic conditions, and cool to warm summer temperatures. The soil can contain clay-loam, loam, peat, or rocky soil; its pH should be somewhat acidic. This tree has excellent winter hardiness; it develops slowly and is relatively short-lived. Range & Habitat: European Mountain Ash is a non-native tree that has naturalized in NE Illinois (see Distribution Map). Outside of cultivation, it is uncommon. This species was introduced to North America from Eurasia as an ornamental landscape tree. Within the state, habitats consist of swamps, bogs, fens, and roadsides. In Eurasia, this tree is often found in mountainous areas with acidic bedrock (e.g., granite). Faunal Associations: In this discussion, information about floral-faunal relationships is derived from observations of both native Sorbus spp. (Mountain Ashes) and European Mountain Ash. The flowers are visited by honeybees, bumblebees, various solitary bees, Syrphid flies, and beetles; these insect seek nectar or pollen and cross-pollination by their floral visitations is required for the development of fruit. Other insects feed on foliage, fruit, and other parts of Mountain Ashes. These insect feeders include the caterpillars of several Acronicta spp. (Dagger Moths) and other moths, the larvae of Pristiphora geniculata (Mountain Ash Sawfly), Aphis pomi (Green Apple Aphid) and Eriosoma lanigerum (Woolly Apple Aphid), the larvae of wood-boring beetles Saperda candida (Round-Headed Apple Tree Borer) and Paria fragaria (Strawberry Rootworm), and the scarab beetle Macrodactylus subspinosus (Rose Chafer). For a more complete listing of the moths, see the Moth Table. Although it is not preferred and often persists into winter, the fruit of Mountain Ashes is eaten by such birds as the Ruffed Grouse, Cedar Waxwing, Pine Grosbeak, Evening Grosbeak, Veery, Swainson's Thrush, and Passenger Pigeon (now extinct). The Ruffed Grouse also feeds on the buds. White-Tailed Deer browse on the twigs and foliage, while the Meadow Vole gnaws on the bark of saplings. Photographic Location: The Arboretum at the University of Illinois in Urbana, Illinois. Comments: European Mountain Ash is rather variable across its range and several subspecies have been described. 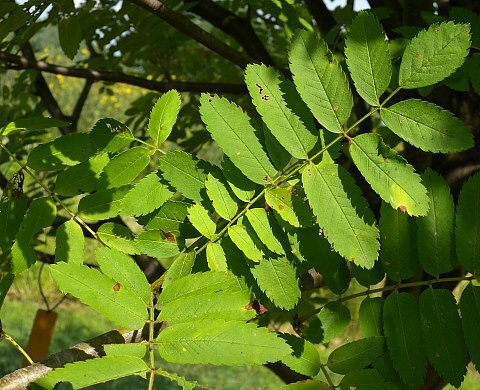 The typical subspecies, Sorbus aucuparia aucuparia, is a small tree with pubescent shoots and leaves, while another subspecies, Sorbus aucuparia sibirica, is a small tree with glabrous shoots and leaves. Other subspecies, which are usually found in Alpine or northern boreal areas, are short multi-stemmed shrubs; these latter subspecies are rarely cultivated in North America. 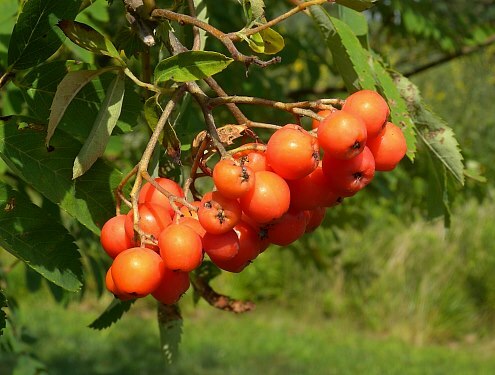 Two native species, Sorbus americana (American Mountain Ash) and Sorbus decora (Showy Mountain Ash), have been found in northern Illinois, where they are quite rare. These native species differ from European Mountain Ash by having larger leaflets (2-3½") with more elongated tips, and their young shoots and buds are glabrous, rather than pubescent or hairy. In spite of their common names, these species are not closely related to true Ashes (Fraxinus spp. ), with whom they share superficially similar compound leaves. Another common name of Sorbus aucuparia is the Rowan Tree.